There are still 9 days left before Election Day in Florida, so this is purely an intellectual exercise – But Gillum could be winning already. Let’s start with an update of total voters who have voted early in-person or voted by mail, as reported by Steve Schale on his Twitter account. Orange hasn’t reported, but was Dem +3,700 yesterday. Next, let’s look at three recent polls: CBS/YouGov [PDF], St Pete Polls [PDF], & Florida Atlantic we can see how the respondent indicated their choice. 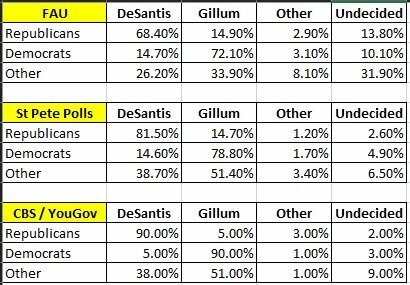 From if we average these three polls, Republicans support Desantis about the same the Democrats support Gillum. 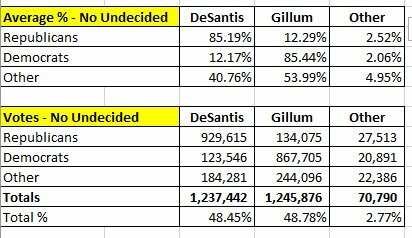 The difference is the Independent voters… who are breaking 5 to 4 for Gillum… very close indeed. If the remaining undecided voters (7.8%) break the same as those who indicated a preference, Gillum is winning by 8,000 votes or 0.33%. 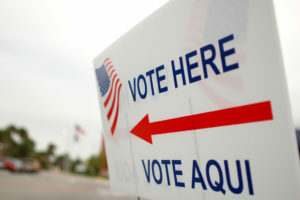 Yes, there are still 9 days left until the election… and this exercise shows just how close the race is and will be.